Last Sunday evening on Sept. 2nd, Jimmy and I walked from our place to Chinatown, up Russian Hill then to Fisherman's Wharf. Right before crossing the Chinatown Gates, we found this funny little cabin that I had read about earlier in the year. Trying side by side collage for my photos today. 2 photos in each set. Jenny Chapman and Mark Reigelman’s "Manifest Destiny!" 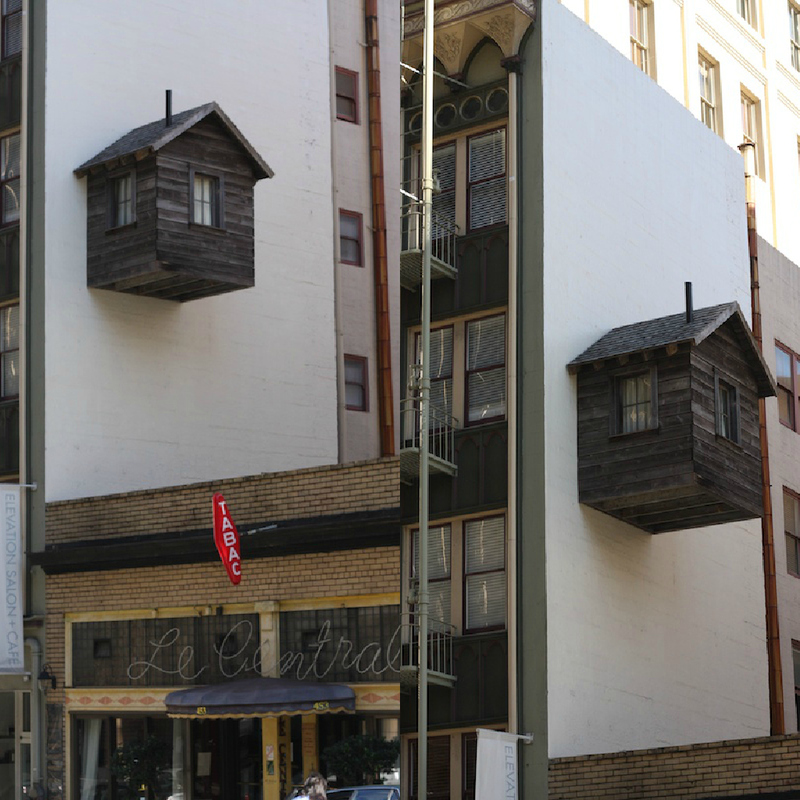 is a temporary rustic cabin occupying one of the last remaining unclaimed spaces of downtown San Francisco—above and between other properties. The tiny cabin is affixed to the side of the Hotel des Arts, floating above the restaurant Le Central like an anomalous outgrowth of the contemporary streetscape. Using a 19th-century architectural style and vintage building materials, the structure is both homage to the romantic spirit of the Western Myth and a commentary on the arrogance of Westward expansion. The interior space of the tiny house can be seen day and night through the curtained windows, a lonely beacon in the city’s dense landscape, and an incongruous, haunting vision from below. The installation will remain in place and be slowly transformed by the elements through October 2012. 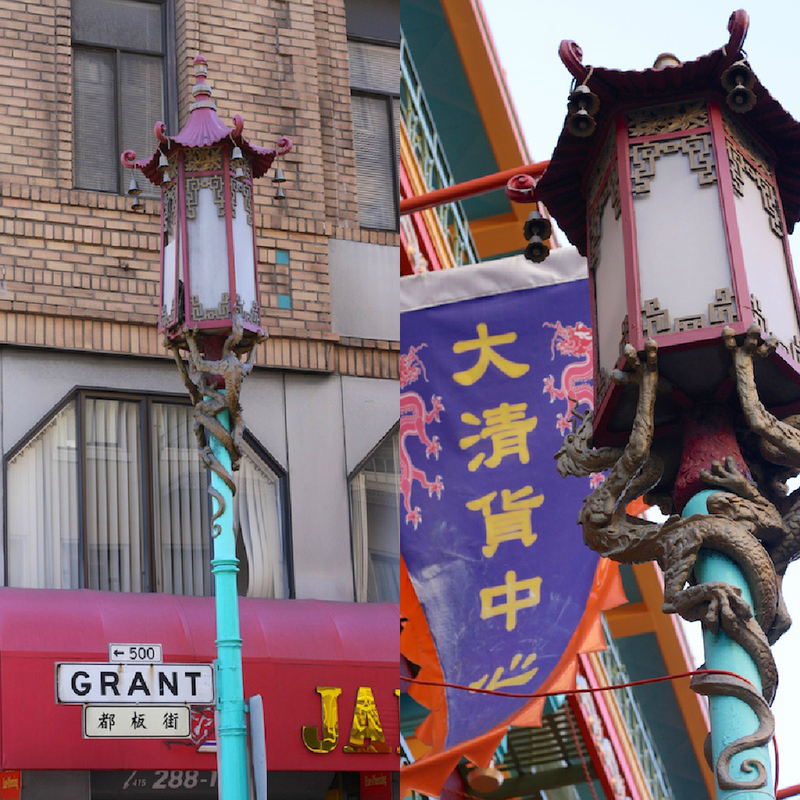 Aside from the tourists, Chinatown really does feel like a different world. The sights, sounds and smells are unique to this very crowded area; it really is a feast for the senses. Dim Sum! Oh how I wanted some! But wasn't even close to hungry, so decided to pass. Besides, Chinatown's just a mile away, so it's easy enough to patronage. 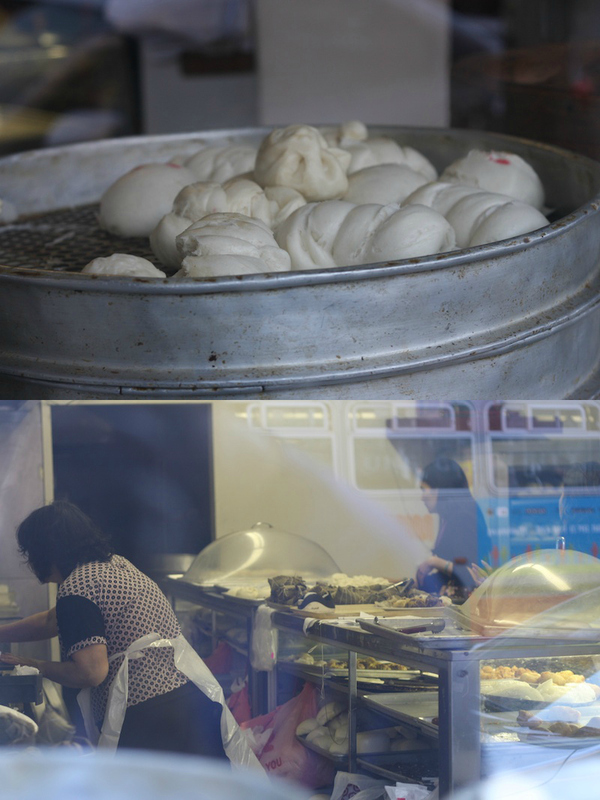 Though I admit we've only eaten in Chinatown twice since we moved to The City. 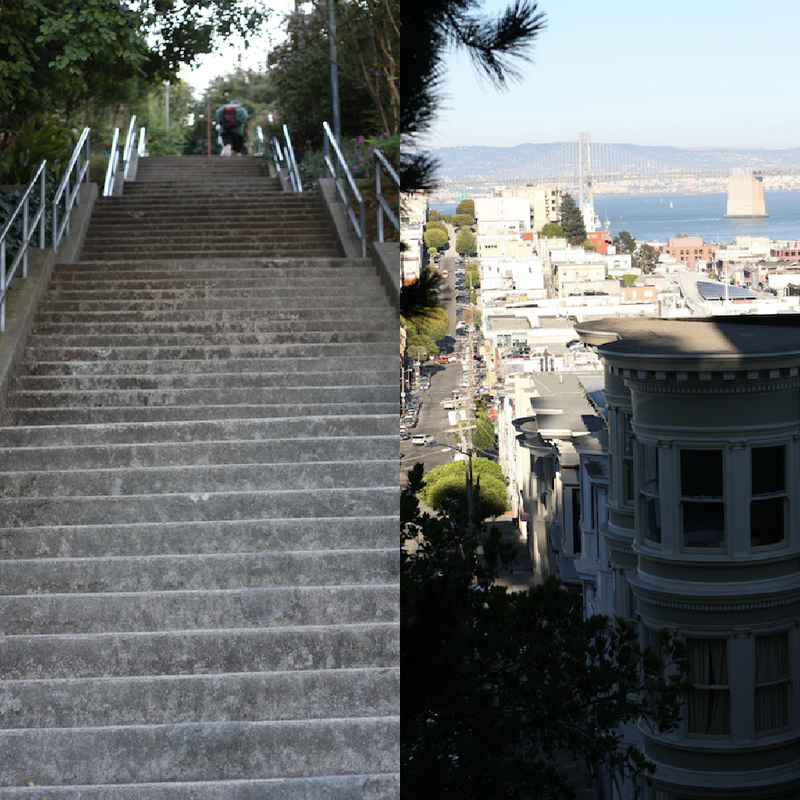 Now it was time to climb climb climb up all those stairs and more to the top of Russian Hill, then enjoy looking back at how far you've climbed. We stopped along to way up to catch our breath and enjoy the views. Spectacular views of downtown. 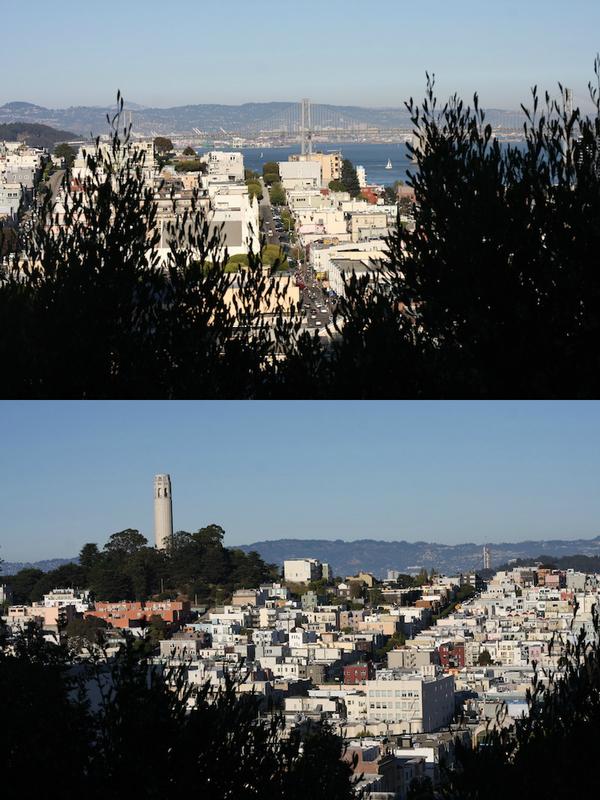 Looking east to the Bay Bridge and Coit Tower on Telegraph Hill. A little fun playing "Eye Spy". 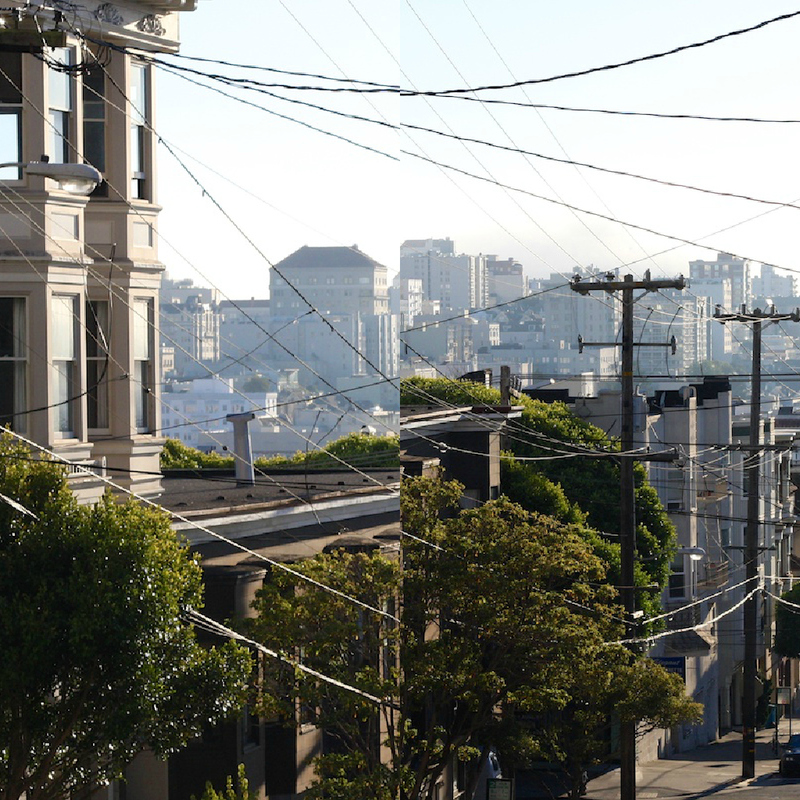 Don't get tangled up in all the overhead wires. 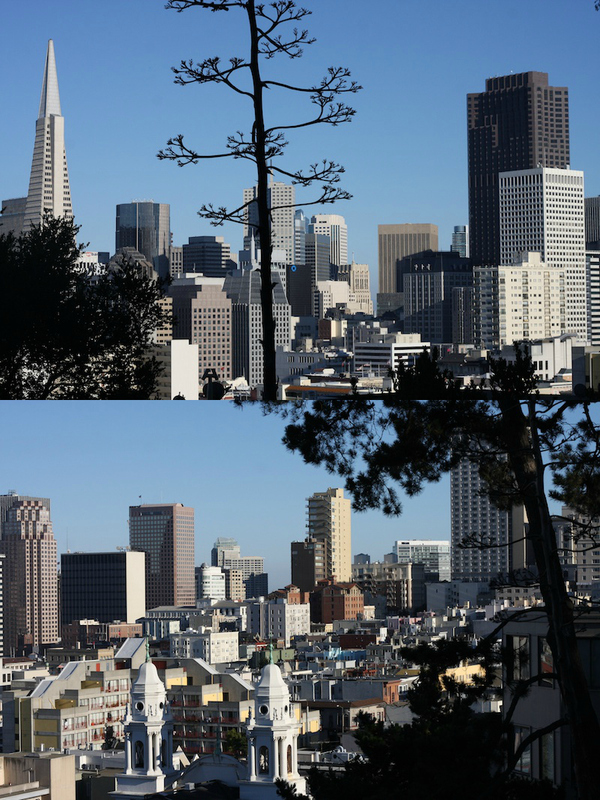 2 views of the Transamerica building...one from Chinatown, the other from Russian Hill. 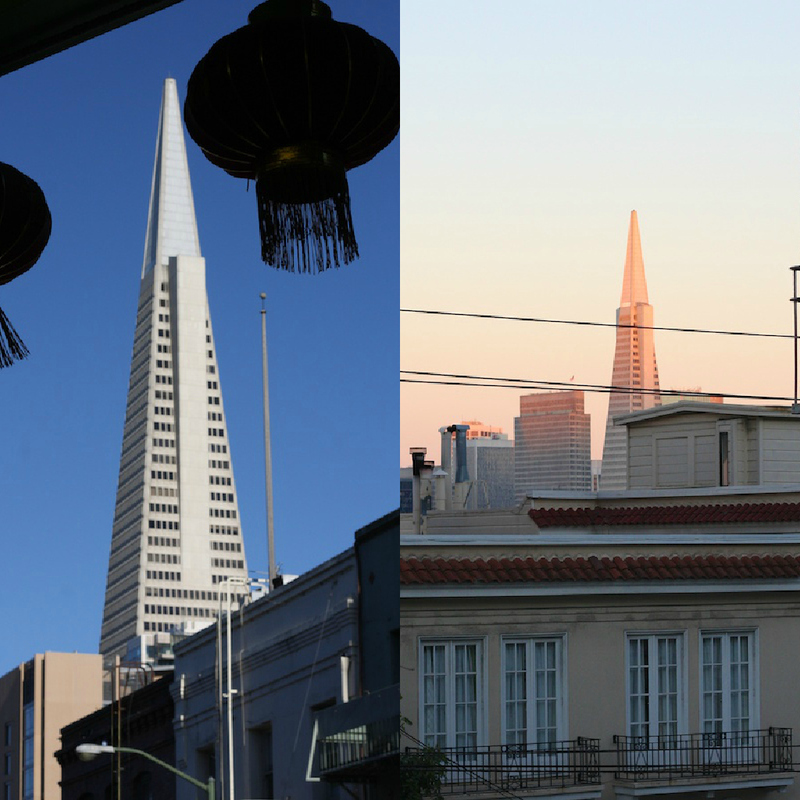 When you're north of Market Street and east of Russian Hill, the Transamerica building will always be the headliner. 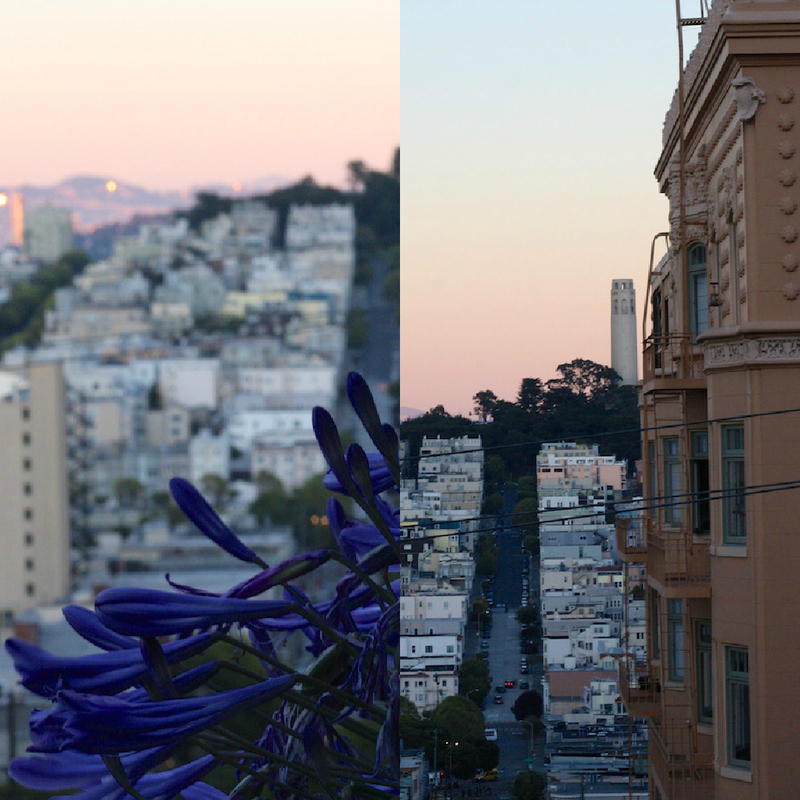 Walking down Russian Hill to Fisherman's Wharf, the setting sun lit up the East Bay Hills while the rest of this side of The City was in the shadows, getting ready for a spirited Sunday night. I love your city - it looks so clean and has such beautiful buildings and always so much to see and do - I am sure you must never get bored. Your temperatures are on the rise and it must feel so good to get ride of the nasty fog - our temps are on the wane - our foggy season is Nov but hopefully we will have a beautiful autumn prior to this. Oh yes, September - San Francisco's summer commences. Love the photos. Oh Wow, great pictures! 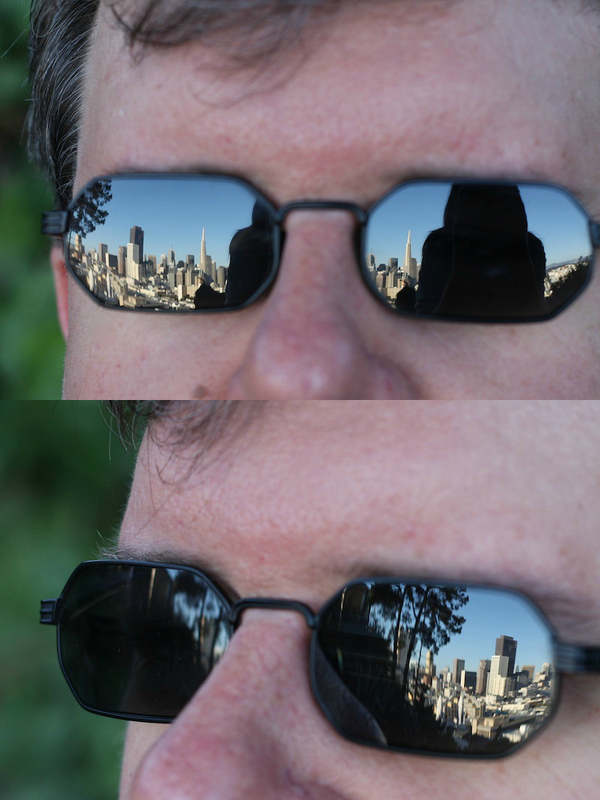 I really do have to see the sights of SF! Love that little rustic cabin, it's something I would not have expected to see up there clinging to the wall. You seem to be really enjoying living in SF now that your have moved from your previous neighbourhood. oh my goodness, I only had to do that prove you're not a robot thing three times.... maybe I AM becoming a robot and I don't know it. Scary stuff. on my second time for this one.....!